Merry Christmas from our crazy crew! We are so excited for the holiday season, and feel so incredibly blessed for everything we have. 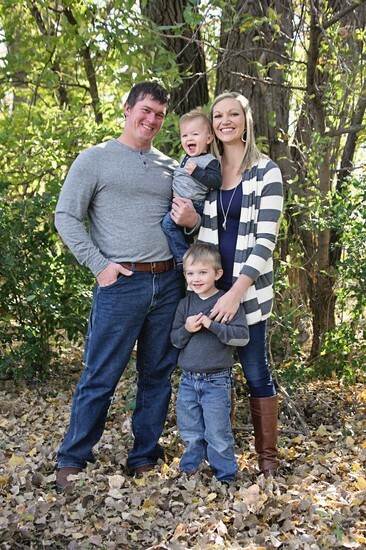 2015 was a great year for our family. 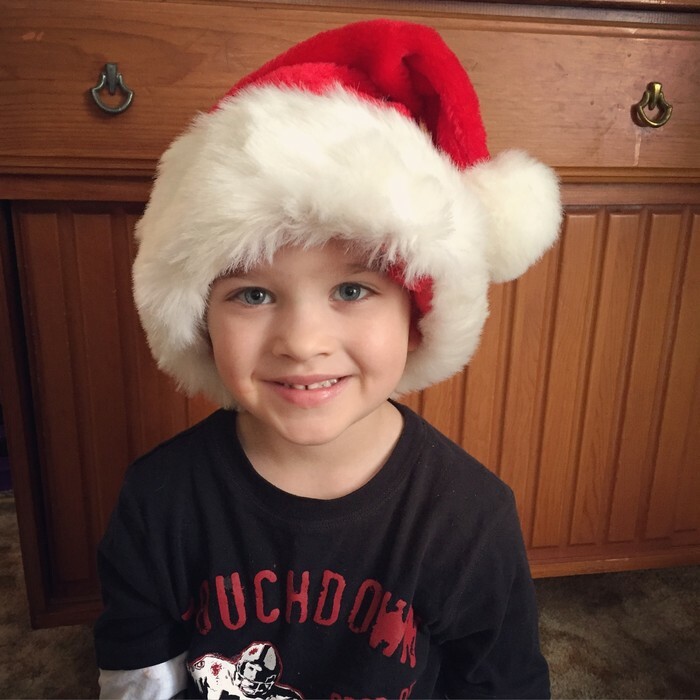 Jace is 3.5 years old and is definitely ALL BOY! 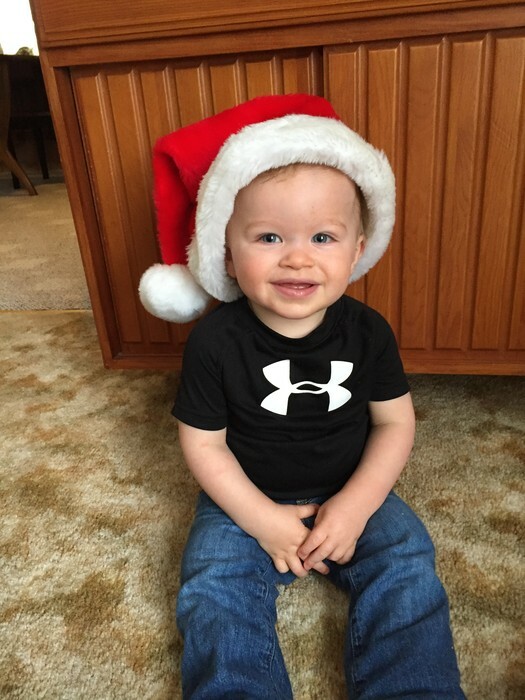 Some of his favorites include: playing farm (& going to the farm with Daddy), wrestling, football, basketball, Ninja Turtles, chicken & fries, Bug Juice, and being outside (especially in this snow!). He started Sunday School with the 3 year old class in September and seems to really enjoy it. It's crazy to think that by this time next year, he will be half-way through Preschool! As wild as he can get, he still enjoys reading books and snuggling with Mommy, and likes to paint and color, or stamp with his dot markers. He continues to be a fantastic big brother and is always there to stick up for Jaden. He has a big heart, and a curious mind. It isn't unusual for him to be asking questions non-stop! 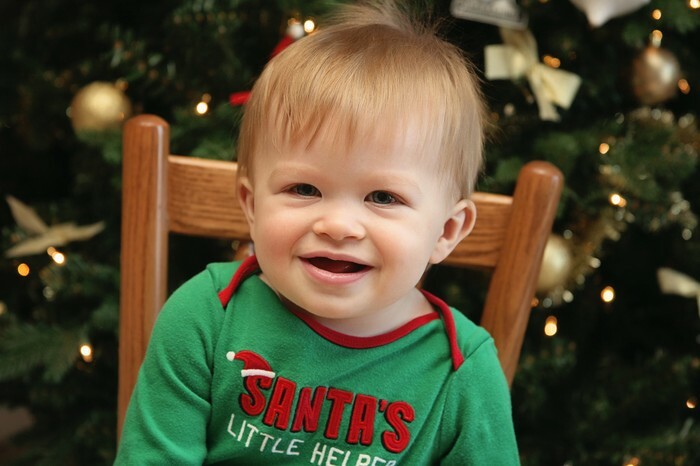 He also really enjoys music, with some of his current favorite songs being Hokey Pokey, Jesus Loves Me, and Kick the Dust Up by Luke Bryan. His favorite pre-bed activity is dancing around the house in his underwear. He must get that from his Dad! 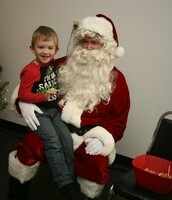 Jace was so excited to visit Santa when he came to DeSmet. 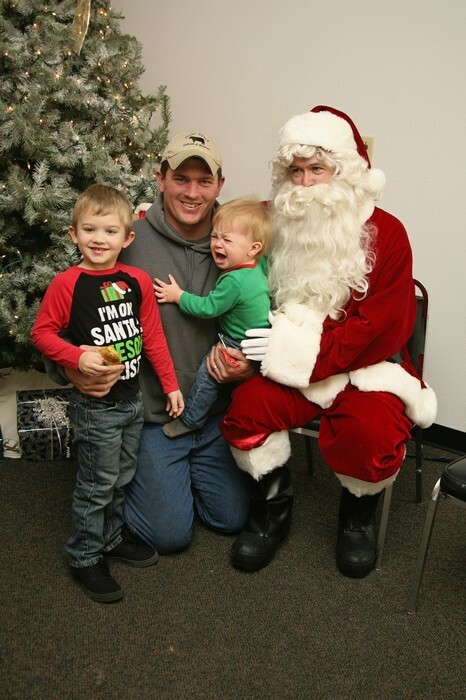 He wasn't sure what to ask for but we have a feeling Santa will know just what he needs. He has been a pretty good little boy! 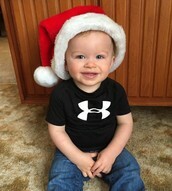 Love this little Santa boy! 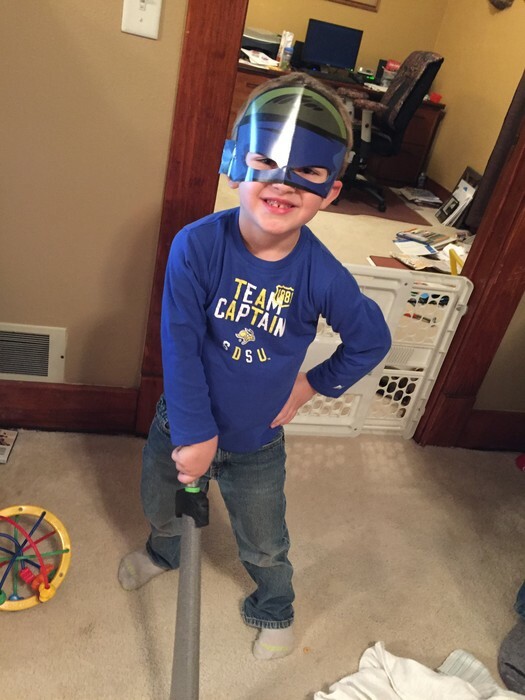 Jace sure loves Ninja Turtles! Leonardo is his favorite... most days. 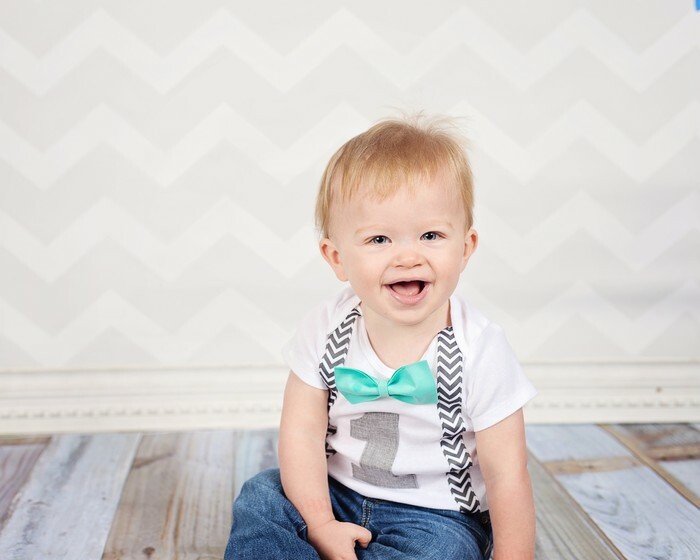 Jaden turned ONE in November - man, that year flew by! He has not slowed down one bit. He is the fastest walking baby boy around. We can't seem to keep things out of his reach before he gets into them, especially whatever Jace is playing with, which makes big brother really happy! He has really taken off - growth wise - since his birthday. It is hard to keep him full during the day. We wonder where he gets that from! He loves to be wherever Mommy is and his favorite word is Dada. 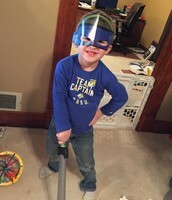 He loves to play with Jace and chase Mia (dog) around the house. Some of his favorites include: his blanket and his thumb, balls & playing catch, climbing on everything he can, iPhones, being held, peek-a-boo, emptying Mom's drawers, banging on pots and pans, and bathtime. 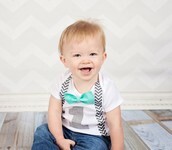 He is a sweet little boy and knows he has us right where he wants us when he flashes that adorable little smile! Sweet Christmas baby! He is obsessed with re-organizing the Christmas tree ornaments. Our tree currently has 98% of the ornaments on its top half. 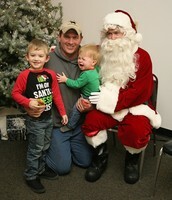 Jaden was not a fan of Santa this year. But, being a mean mom, I had to get him in there to remember this one forever. Oh, Jaders! 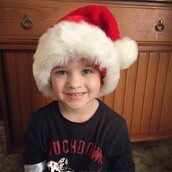 Love this little Santa too! We continue to keep busy with our jobs and hobbies. 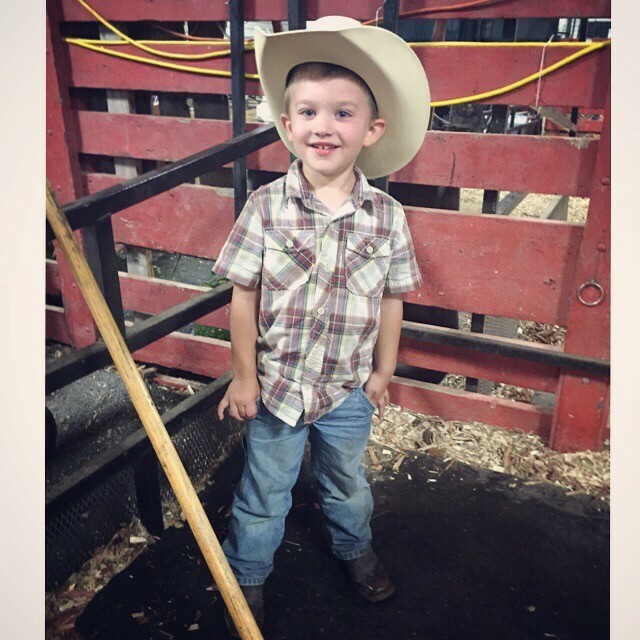 Blake continues working for the family farm at Hojer Ranch. They are currently getting ready to start calving (and might even have had a calf by the time you read this letter). 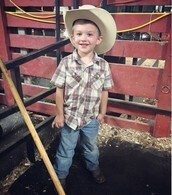 The day-to-day work on the farm keeps him plenty busy, but finds time to make sure Jace gets his "farm fix" every now and then. He coached football in DeSmet this past season. He really enjoyed getting back into the sport and the kids really enjoyed having him (or so their parents tell me). 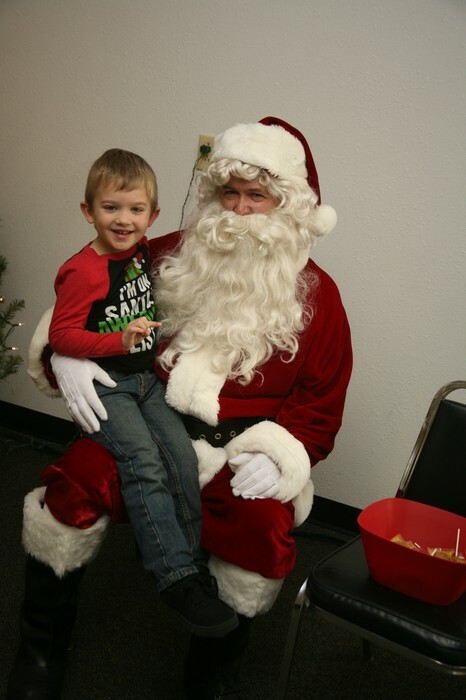 He also keeps busy on the Kingsbury Cattlemen Association board and all of the honey-do-list items that Jenn comes up with for him on the days he is home. As Jace would say, "Daddy had bad luck" hunting this year and didn't get that big buck he was searching for, but let's be honest - the walls are plenty decorated already! He also enjoys spending time golfing Men's League in the summer. I am in my 6th year of teaching overall, and 5th year of teaching 5th grade in DeSmet. I have a very full class this year, and enjoy my time with all of them. It is hard to believe the school year is half-over already. I am also coaching Junior High girls basketball again this year and we are off to a pretty good start. I don't ever get the opportunity to play basketball for fun anymore, but due to low numbers in the JH, I get to step in and play defense every now and then. Definitely isn't the same! The boys and I made it over to an SDSU game this fall with Grandpa Alan & Grandma Pam while Daddy was hunting west river. I was selected as one of the top 50 female-athletes in SDSU History in celebration of 50 Years of Women Athletics at SDSU. It was such an incredible honor and such a fun event to be a part of. How awesome it was to see so many women at the banquet and the game that carved the way for me, and my teammates, to have the opportunities that we did. Just felt so grateful for everything they did for us! I am still taking pictures on the side and have stayed pretty busy with that. I do enjoy being a photographer, but I also miss my time away from my boys. Being a mother is the best job I could ever have. Although some days can get long, our hearts are definitely full! Here are a few of our favorite memories from 2015. We hope that you find yourselves happy, healthy, and surrounded by those you love. May you have a very Merry Christmas & a blessed 2016!